The Epiphany of the Lord is the fourth major feast of the Christmas Season. 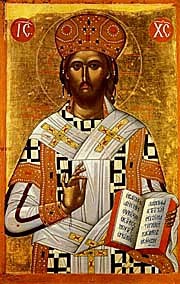 The word epiphany has its roots in the Greek word phaneia, which means appearance or manifestation. Traditionally celebrated on January 6th, in our country (U.S.A.) the Solemnity of the Epiphany of the Lord has been transferred to the Sunday between January 2nd and January 8th. The Gospel proclaimed at Mass on Epiphany Sunday is Matthew 2:1-12, the visit of the magi. Epiphany Day, featuring the Three Kings riding on camels or horses. The Kings may visit the nativity scene at the local church. And on Epiphany Day in the homes, the fiesta usually includes the traditional Three Kings’ Cake. Baked in the shape of a crown, candied fruits can be used as jewels in the crown. Baked into the cake is a tiny plastic doll, symbolizing the infant Jesus. (Sometimes a bean replaces the plastic doll.) The person whose piece of cake contains the doll is King for the day, and will experience good fortune! You can make a Three Kings’ Cake to celebrate Epiphany in your home, too. Here is one recipe, and another can be found here. While we celebrate Three Kings’ Day and sing carols about the Three Kings, it is interesting to note that nowhere in Scripture are we told how many kings or magi actually visited the infant Jesus. We traditionally refer to Three Kings, because Matthew 2:11 refers to the three gifts which the magi brought: gold, frankincense and myrrh. Gold symbolizes royalty, and is a gift fit for a king. Frankincense is an offering fit for God, and symbolizes that Jesus is God. Myrrh is the perfumed scent which was used to anoint the bodies of those who had died before they were placed in the tomb. This gift symbolizes the future Passion and death of the Christ Child. The carol, “We Three Kings of Orient Are,” by John H. Hopkins, Jr., can be a wonderful tool for catechesis on the symbolism of these three gifts brought by the magi. (the visit of the magi) and the singing of hymns and carols. You can find an Epiphany Home Blessing from the United States Conference of Catholic Bishops here. 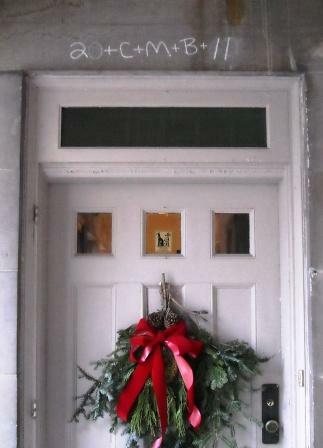 The Church of St. Mary at Clinton Heights in Rensselaer, New York has a nice Epiphany Home Blessing Service posted on their web site. You can find this link here. You could easily adapt this service for your own home. Just remember to replace the year “2011” with the year “2019” to reflect our new year of grace. 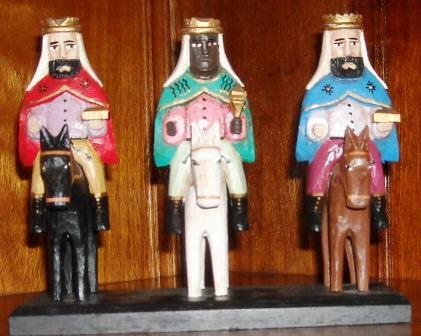 Make sure you place your Three Kings’ figures in your home nativity scene today. 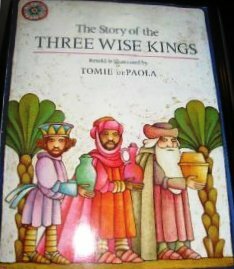 As you do so, if there are children in your household, read together “The Story of the Three Wise Kings” by Tomie dePaola (ISBN 0-399-20998-0). Invite children to draw their own picture of the Visit of the Magi, or maybe they could even role play this story. The children could create their own gifts to place by the manger today. Perhaps these could include a card with three concrete acts they will do this new year to follow Jesus. Here is a rather elaborate Epiphany coloring page. When we think of Epiphany, perhaps the first thing that comes to mind is the visit of the magi to the Christ child. Yet we celebrate two other manifestations of Christ, as well. 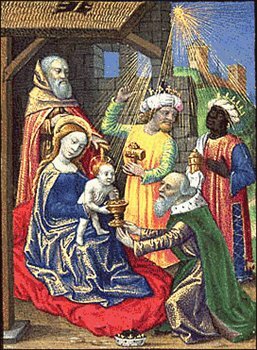 On Epiphany we celebrate not only the visit of the magi, but also the baptism of the Lord, as well as his first miracle of changing water into wine at the wedding feast at Cana. A wonderful hymn with which to celebrate these manifestations at Epiphany is "Songs of Thankfulness and Praise" (text by Christopher Wordworth). You can download this score here. Raise your voice in thankfulness and praise on this merriest day of the Christmas Season - Epiphany! Even though our civil new year began on January 1, it is not too late to make some resolutions for this new year. This feast of the Epiphany could help you to reflect on what you might want to do spiritually this new year. 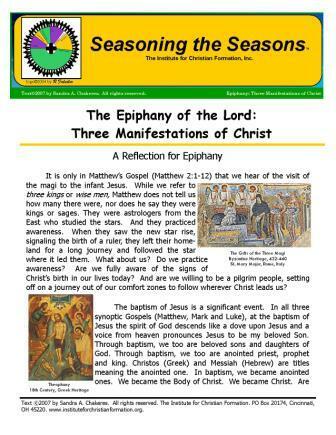 Our Epiphany Reflection handout, “The Epiphany of the Lord: Three Manifestations of Christ,” might serve as a guide for your reflection. Click on image above to download our Epiphany Reflection handout. While we celebrate Epiphany on a Sunday, traditionally Epiphany is January 6th, the Twelfth Day of Christmas. Epiphany is also the beginning of the Carnival Season. Carnival is not a liturgical season on the Church’s Calendar. But is does have many connections with our faith. The word “carnival” literally means "farewell to the flesh". The carnival season lasts from Epiphany through Shrove Tuesday (or Mardi Gras), the day before Ash Wednesday. Find out more at our Carnival web page! 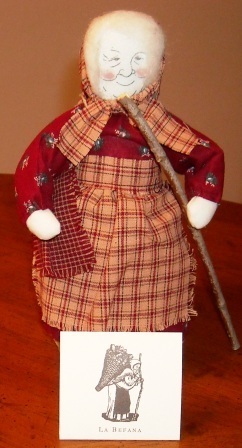 "La Befana" - The Christmas "Witch"
January 6 is the traditional date for Epiphany. Have some fun with the children in your life! Tell them the story of “La Befana.” In Italy, it is the Christmas “witch”, Befana (whose name comes from the word “epiphany” and who legend says wanted to join the Magi in their search for the infant Jesus), who now goes door to door bringing gifts at Epiphany. 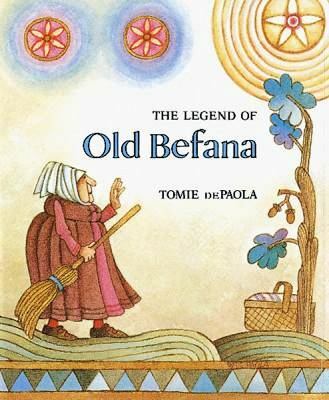 Read children “The Legend of Old Befana,” by Tomie dePaola. If you are so inclined, let girls dress up as La Befana (boys could always be the Three Kings!) and take small gifts to neighbors, or perhaps to a local nursing home to spread good cheer. Sing Christmas Carols as part of your visit. La Befana wanted to join the Magi in their search for the infant Jesus. May we, too, continually search for Christ in our midst! "For nearly a half century, the Catholic Church in the United States has celebrated National Migration Week, which is an opportunity for the Church to reflect on the circumstances confronting migrants, including immigrants, refugees, children, and victims and survivors of human trafficking. The theme for National Migration Week 2019 draws attention to the fact that each of our families have a migration story, some recent and others in the distant past. Regardless of where we are and where we came from, we remain part of the human family and are called to live in solidarity with one another." Find resources from theUnited States Conference of Catholic Bishops here.